Warning: Anyone can become the subject of a blog at any moment. It can be totally random. I am thankful that I was raised right. I am thankful that I was raised to give a damn about this world. And I am seeing a generation of selfish young privileged people who simply care about no one but themselves and their immediate friends. (no, not everyone of course, but too many). I teach Krav Maga because I care about people, their wellbeing and their safety. I try my best to encourage people to be safe and careful and aware. But first you need to actually care. Sitting here during a long layover at Charlotte airport I saw a young pretty blond haired woman walk by. Like many of us here two pieces of hand luggage were piled one on top the other, and she was snacking on pretzels. And then one piece of luggage fell. I know the feeling, frustrating. As she bent over to adjust her luggage she held her bag of pretzels at a bad angle and quite a few fell out on the carpet. Knowing that if she left them there people would step on them, crush them and ground them into the carpet I assumed she would pick them up right away. Sadly I was wrong. She just walked away. And then I did what I often do, I butted in and said something. I have done this on the New York subways when I saw kids throwing trash on the floor and I have done this in Jerusalem. I said, Excuse me, you left a bunch of pretzels on the floor. She replied, "What do you expect me to do?" Lets think about that for a moment, shall we? What indeed! What a stupid question. A girl drops her pretzels in a public place and just walks away, leaving a mess behind her privileged path. What I expect her do is pick up her trash and throw it in the trash bin. 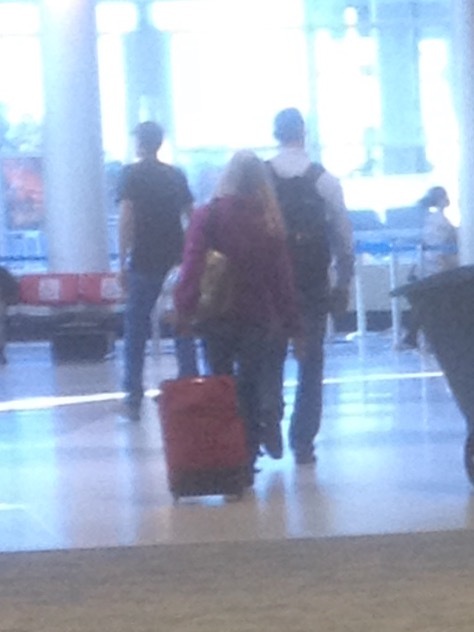 I expect her to care about the cleanliness of the airport, I expect her to give a damn about this world. So she felt embarrassed and returned to pick up her pretzels. I helped her. I got down on my knees and helped her pick up her trash. Then she noticed her hand luggage a few feet away and said, "And now I have left my freakin' luggage unattended!" With anger in her voice she walked away. I can only hope that perhaps this incident made her think a little. She never thanked me for helping her. She never apologized for her rudeness but at least she did listen to me. Young lady clean up your mess! Perhaps her parents never spoke to her this way. Perhaps they never expected anything of her. Perhaps she always felt that "others" would do the picking up and clearing up for her. Our Krav Maga self protection program is based on the premise of caring, not only for yourself but also for others. Our Krav Maga is about caring about everyone and standing up for what is right. Not caring leads to chaos, it starts with dropping your trash on the floor and walking away and it ends with massacres and mass murders. When will you stand up for what is right? Good values, are they totally out of style?